Hertz Furniture, the leading national school and office furniture dealer, has launched a new initiative: Effective Learning White Papers. Each month, an authoritative report on topics related to optimized learning environments will be featured on its website. Available as a free download, the white papers offer in-depth coverage of evidence-based best practices in teaching style, classroom design, and other environmental factors. As school furniture experts for nearly 50 years, Hertz Furniture is well-positioned as an authority on active learning and classroom design, helping educators understand the issues, solve problems, and make decisions that effect their student's learning environment. 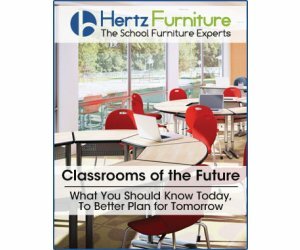 Hertz Furniture's effective learning white paper for March 2015, "Classrooms of the Future," identifies the latest trends in K-12 classrooms and outlines how educators can transform their instructional practices and classroom designs to facilitate student achievement and prepare students for the challenges of tomorrow. Presenting the latest research, the white paper covers topics such as the use of technology and mobile devices in the smart classroom, flipped classrooms, the changing role of teachers, 21st century classroom layouts, and more. The Hertz Furniture website also features an entirely new section, Project Solutions, where visitors can sign up to receive expert help with the design, management and logistics associated with furnishing a new school. The complimentary services include the guidance of a dedicated project specialist, interior design services, and project & logistical management. "I am thrilled to announce our White Paper initiative, offering educators the latest best practices in classroom design, instruction, and effective learning," says Hertz Furniture President David Mocton. "In today's rapidly changing landscape, it's hard to keep up with what's new in 21st century education. Our monthly featured white paper offers forward-thinking schools a guide to updating or transforming their instructional environment to serve as a catalyst for student achievement and success." For nearly 50 years Hertz Furniture has supplied schools, religious institutions, businesses and government offices with top quality commercial furniture and superior customer service. Speedy Quotes, Quick Ship products, a wide selection of Eco-Friendly furniture, a free Project Planning and Design service and the best warranties in the industry are just a few of the ways that Hertz Furniture provides added value to its customers. For additional information on Hertz Furniture and its extensive line of products and services, please visit Hertz Furniture, speak to a furniture specialist at 888-802-6549, or send an email to jonathanyunger@hertzfurniture.com.